I roamed further afield this week to visit Newbury parkrun as Other Dan was away running one of the Polish parkruns. 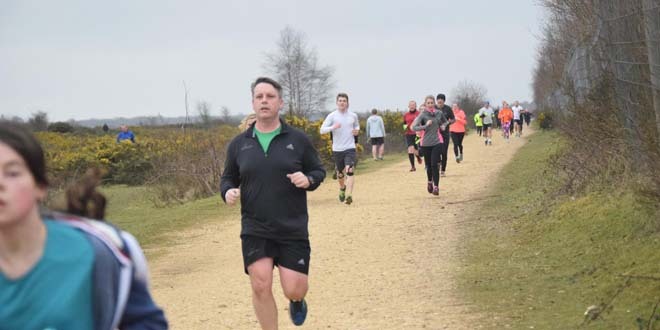 Newbury parkrun takes place on Greenham Common, which is famously known as the former Royal Air Force station RAF Greenham Common and the Greenham Common Women’s Peace Camp. The RAF base opened in 1942, it was used by both the Royal Air Force and United States Army Air Forces during the Second World War and the United States Air Force during the Cold War. After the Cold War ended, it was closed in 1993. Greenham Common Women’s Peace Camp was a peace camp established to protest at nuclear weapons being sited at RAF Greenham Common. The camp began in September 1981 and was active for 19 years and disbanded in 2000. In 1997 Greenham Common was designated as public parkland. 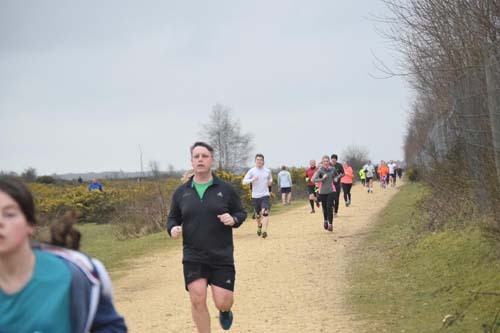 Newbury parkrun came into life in February 2012 and has been on my radar ever since highviz filmed one of the events with a the aid of a hexicopter. This was back when I first started noticing enthusiast film makers using ‘drones’ to mark some amazing short films. The distance from home to Newbury parkrun is on the edges of ‘the art of the possible’. Also referred to as the unwritten rule of whether I would be home in time to maintain good relations with Mrs Dan. I generally frame that as an hour or so of driving, which I usually bend to one and a bit hours. I was a touch late leaving thanks to the usual fight with the satnav as it refused to find the location based on all rational information. In the end I plumped for the general vicinity and hoped that local signage would get me there. I rolled up into the free parking located in the industrial estate nearby, after making some wrong turns and taking other drivers down some dead-ends (whoops! ), with a 5 minute jog to the start line. No problems in finding the congregating runners and we were off running following the usual parkrun briefing to thank the volunteers, ensure junior runners are kept within arms reach of a parent or guardian, dogs to be kept on a short lead with one dog per runner, and for everyone to have fun. The course is simple one lap affair with plenty of signs to direct runners with firm trail underfoot so road shoes easily catered for. I don’t remember there being too many marshals out on the course, the signs were clear and you could easily see all the runners across all sides of the course, but there were the usual friendly marshals at key points. I enjoyed my run so thanks to the event team at Newbury parkrun. A speedy exit was in order for me to avoid being late home and facing the wrath of Mrs Dan.